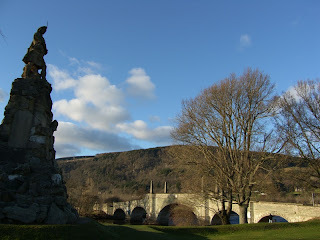 By the Aberfeldy Bridge you will find the Black Watch memorial commemorating the raising of the world famous regiment. In the wake of the 1715 Scottish rebellion, companies of trustworthy Highlanders were raised from loyal clans. They became known as the Black Watch for the watch they kept on the Highlands and from their dark government tartan.